We could all live without another compact SUV. The dozen or more already on the market suit every imaginable purse and purpose. So what’s the Mazda CX-5’s reason for existing? The simple answer is that Mazda’s new bouncing baby bear is a smaller, cheaper model intended to round out the brand’s set of SUVs—well, and that the small-SUV category is a sales mine and no company can afford to sit it out. But proving that nothing is ever as simple as it first seems, the CX-5 embodies two ulterior motives: This is not only our first look at two major Mazda initiatives, but it’s also an accurate preview of other models scheduled for near-term introduction. Before we delve into that grand plan, consider the key parameters that define the CX-5. It’s a compact SUV designed fresh from the ground up with no hand-me-down components. It lives at the large end of its sprawling class and casts a shadow only slightly smaller than Mazda’s middle-child CX-7. So the CX-5, a close size match to the Kia Sportage, rides on a 106.3-inch wheelbase (exactly two inches shorter than the CX-7’s), and it has length and width dimensions of 178.7 and 72.4 inches versus the CX-7’s 184.3 and 73.7. In lieu of the CX-7’s sleek, swoopy, smiley-faced envelope, the CX-5 has a much boxier, more practical wrapper. The two Mazda siblings are about the same size inside, with comfortable room for four occupants and a third seatbelt in back for an occasional fifth passenger. (Although we spent a day driving four CX-5 prototypes in Iceland, final details regarding interior room, power, mileage, and price won’t be released until the U.S. introduction at December’s L.A. auto show.) In keeping with the CX-5’s unpretentious role as the most diminutive and wallet-friendly SUV in Mazda’s lineup, it will hit the deck with but one engine—a 2.0-liter inline-four rated at about 160 hp—and four driveline choices: front- or all-wheel drive with a six-speed manual or six-speed automatic transmission. The CX-5 doesn’t drive like any other existing compact SUV. It’s more lively, more involving, more steeped in the sports-car character that Mazda harps on about in its Zoom-Zoom advertising. The steering is quick and crisp, body motions are held tightly in check, and the ride is purposely firm underfoot. This is the SUV for those who promised they’d never stoop to driving one. This is where fun-to-drive lives when there are kids to convey, dogs to deliver, or a long weekend’s worth of camping gear to haul. The first clue that the CX-5 is something different is revealed by its fresh exterior design. The previous Nagare (“wind-driven flow”) theme that gave us more ear-to-ear grins than we really needed is heretofore supplanted by Kodo—a less flamboyant, more tasteful “soul of motion” appearance. 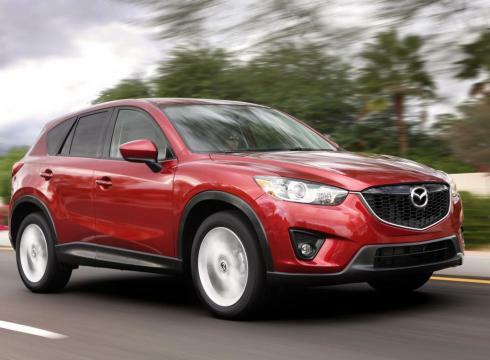 Where the CX-5 goes stylistically, other Mazdas will follow. The same is true of the CX-5’s inner workings. After a serious bout of introspection, Mazda’s top management mapped a path to the future consisting of a menu of essentials such as lower emissions and higher gas mileage, as well as desirables such as added safety features and new creature comforts. Thankfully, a fun-to-drive temperament also made the cut as a core Mazda virtue. The slightly inscrutable name for Mazda’s mix of fun and function is Skyactiv Technology, and it reaches deeply into every nook and cranny of the body structure, chassis, and powertrain. That means the CX-5 has a stiff, light foundation made mostly of high-strength steel. (Aluminum and more exotic materials were avoided to contain cost.) Mazda says the steering and suspension gear were designed with agility, linearity, and concise driver feedback as the goals, and from our encounter, it feels like the company is telling the truth. The cockpit was laid out to provide better-than-average outward visibility, a natural relationship to all controls and instruments, and a seat capable of supporting an aggressive driver’s boldest commands. What the 2.0-liter engine lacks in raw muscle—it will make 163 hp in the 2012 Mazda 3—it more than makes up for with a willingness to please. To deliver adequate acceleration with exemplary gas mileage, this powerplant stretches the bounds of efficiency with a 13.0:1 compression ratio, direct injection, variable intake- and exhaust-valve timing, and a carefully tuned four-into-two-into-one exhaust manifold. The Atkinson cycle allows use of an extra-long expansion stroke for maximum mileage with no need for premium gasoline. Compared with Mazda’s best current four-cylinder engines, the new Skyactiv design is 10 percent lighter, 30 percent lower in friction, 15 percent more fuel efficient, and 15 percent more energetic at low and midrange rpm. The only negative we observed was a boomy soundtrack above 4000 rpm, a concern that may be resolved as NVH characteristics are fine-tuned before production. Although the CX-5 is unlikely to accelerate to the head of its class (we estimate that this 3300-pound package will accelerate to 60 mph in about eight seconds), it might delve into uncharted gas-mileage territory. Compared with the high-teens to mid-20s mpg ratings common to compact SUVs, the CX-5 is expected to crest the 30-mpg-combined barrier in its most efficient front-drive, manual-transmission trim. One interesting data point: In Mazda’s testing, the Euro-spec model we drove delivered 23 mpg at a cruising speed of 84 mph. While they were at it, Mazda engineers developed a 2.2-liter twin-turbo diesel four-cylinder that produces 170 hp at 4500 rpm. That engine will be a mainstay in Europe, but we won’t see it in the U.S. for at least 18 months. It’s currently under consideration for our market as an option in the next Mazda 6 sedan. The true significance of the Skyactiv Technology initiative is that it will reach beyond the CX-5 to serve as the blueprint for next-generation Mazda 3 and Mazda 6 models. Based on the first impressions of what Skyactiv Technology can deliver, it’s looking as though anyone with an appetite for driving pleasure will find his or her hunger sated at Mazda. Leading the fun-to-drive pack, the CX-5 goes on sale early next year as a 2013 model. Although no pricing has been announced, expect the window sticker to start at about $20,000. The interior trim wasn’t in final form in the models we drove, but the plastic materials we inspected were of high quality and showed attractively painted, textured, or grained surfaces. There’s a minimum of brightwork inside and out, and leather wrappings for the steering wheel, shifter, and hand-operated parking brake likely will be standard. Both cloth and perforated-leather seating surfaces will be available. Mazda took this opportunity to significantly upgrade its safety and infotainment equipment. A 5.8-inch touchscreen is standard fare and can be commanded by a round multifunction controller located on the console. Bluetooth and the essential USB and auxiliary connections are provided. The list of optional equipment includes dual-zone automatic climate control, a rearview camera, lane-departure warning, and automatic headlamp-beam control. A new system called “smart city brake support” uses an infrared sensor to identify objects in the path ahead and automatically stop a vehicle traveling at speeds of up to 15 mph and to significantly diminish closing velocities above that speed. Not only is the rear seat roomy enough to carry two strapping adults or three children without complaint, but the backrests are also configured with a 40/20/40-split arrangement to accommodate long or bulky cargo. All three portions can be released from the 17-cubic-foot cargo hold, which also offers some underfloor stash space. So the CX-5 is not only a major stride forward for Mazda but also a compelling reason for die-hard SUV haters to reconsider whether fun and function can co-exist in one vehicle.